Any update on retail release of ISOstick? Just throwing my 2 cents in on this aswell, don't forget Zalman isn't exactly a small company, they have the money and the production volumes to get the prices down. The IsoStick is a new product, new to market, and still in active development. My primary interest in it is the plans to add 'write' functionality to it, doing away with the need to physically write out to a CD/DVD/BD before ripping it back to ISO again. I'm aware there are products to master an ISO through software only, but there are also more than a few instances where proprietary software insists you write it to a physical disc. Additionally @elegantinvention seems to be very responsive to users requests so far, and is happy to work on improvements to the product based on user feedback and requests. For the record I also have a Zalman VM-ZE200 that I use on a semi-regular basis, it has it's uses, and it also has it's limitations. It has a higher storage capacity, and the built in LCD is suitable for selecting the iso to mount, but it can also be a nuisance to carry around, and if you have a large number of ISO's on it, it can be tedious scrolling through them. The isostick is more expensive, is limited by MicroSD card size, and bus speed, but it's in active developement, the developer is responsive, and the isosel menu is a good alternative to a built in screen. So I see the isostick as a promising alternative, with a few 'watch this space' notes. Just chiming in here too. I have a Zalman too, and use it everyday. However I've followed the development of the ISOStick since the day I heard of it and purchased one of the first batch released. Its a decent tool, but never expected it to replace my Zalman by any means. Its another tool I use in addition to the Zalman, and I dont regret buying it. Before the ISOstick I often wished I had two Zalmans in fact, since I use it so often. I purchased the ISOstick because I wanted to support its development and its creator. I never expected it to be the equal of the Zalman, nor did I expect it to be greater by any particular criteria. Somtimes you buy things simply because they are unique and novel ideas. I was interested to see how it worked and wanted to have a unique tool to play with. So for me a comparison between the devices is moot. They are not the same, and tho they share some similar functions, one is not a replacement for the other IMHO. let's setup a (logical) basic. While it's clear that Zalman and isostick are two different thingies (who can have any doubt on this simple statement !!! ), my understanding was/is that their main targets (like booting from ISO, or whatever bootable image) are JUST THE SAME. How they will get the target, and the associated flexilbility level in obtaining it, is a matter of performance of the specific thingy. That having said, one of the most important lesson learned during my life & working experience is that before going to buy/own a "new system or technology" , it is worth to make an evaluation/analysis of its "cost of ownership", comparing the new technology and the old ones. In this comparison, which makes sense or is justified only when it is made between 2 or more systems having the same targets/scopes, one of the most important point is the related initial costs (excluding those necessary for the maintenance) which, for many people, has a great weight in the evaluation. In this way, a higher cost for the new system could be only justified if all the other (weighted) comparison items, such as performance,maintenance costs, and so forth, will report acceptable and comparable scores. By using all the above considerations, I do not seem that the higher price of isostick can be justified and balanced by its performance., compared to Zalman. Another thing is if people is available to spend money, though and only because of a new technology - just for following the latest fashion/trend. Personally, I do hate wasteing money and until isostick price will not be deeply reviewed, it can remain only as an interesting, small technological thingy, but not to buy. A last side note on Wonko's statement referred to Mr. Marchionne, CEO of FIAT cars. Don't you think that FIAT's outrageousness is just the cause (or one of the main ones) why FIAT is failing ? Fair enough, lots of people insist of maximized value for money. Some others prefer removing perceived quality issues by going for what they think is the best (or most expensive) item as long as the price isn't too crazy. You'll just have to wait till things get cheaper then. You'll not be surprised I'd prefer an interface such as Thunderbolt also (but my money tree isn't groing that fast, hehe). Almost tempted to ask how you'd value Apple's devices, but I'd better not as such stuff is out of my league also and I can't be fussed being a fanboy of anything at all. For what its worth, you are booting from the isostick into a menu of ISOs -- not booting a full OS then running an application. The machine you boot the ISO menu on does not need any sort of OS or, indeed, even a hard disk to boot from, just isostick. That aside, as many have pointed out, they are two very different devices, and I expect they will only separate further as time goes on and more features are added to isostick. In terms of the pricing, certainly we could argue over any price, but it is the one I have settled on for now in order to cover the device and the ongoing costs of development. Will the price ever go down? It is possible, especially once higher volume production kicks in. It is obviously not in my best interest to limit the potential sales There are still a few compatibility issues to sort out before I am willing to talk to places like Newegg, though. I like ( ) people which tries to stay within the focal points of a discussion/thread. I guess one point shall be clarified, at first. Infact, it should be clear that while I greatly appreciated your efforts into isostick development, what is my main concern is the high (actual) initial price which, in my view and considering that isostick is not on a stable and robust phase yet, could not encourage people to buy it and so not partecipating to support/help its development. Yep, that would be my personal opinion, but the point I was trying to make is that you won't be able to "talk" to Mr. Marchionne, let alone convince him about the foolishness of the pricing of some of his cars nor about the complete lack of any valid new product from his R&D and/or designing staff. But that is industry, an established one, and there are tens of car manufacturers, each one with a set of comparable models, so, if you need a car you can compare and choose among very similar or similarly target products (this is called "competition" and can lead to wider posibilities f choice). Zalman is as well part of industry, AND their thingy is - at least - on third generation, Iodd 2501/VE-200/VE-300. Isostick is a "first release" and still belongs more to artisan work/prototyping than industry, and the other (similar but not actually the same) devices such as "digital floppy disks" for the manufacturing industry (which more or less use the same principles) are in a much higher price range (both as "absolute price" and as in "price compared to actual features/contents"). As I personally see it, the Zalman ZM-VE300 is also outrageously priced - being it an industrial product - but the early Iodd 2501 came originally on the market priced US$70 (see above thread). Now, around two and a half years later you can have from Zalman a "better" product at 70% of it's original price. If some of the "decision maker morons" in any of the other electronic hardware industries for once wake up and do some work, they may decide that (.iso or .img) image selection can be a market and start producing something similar, the price for a "Zalman like" will go down in no time (and as well something *similar* to Isostick may well enter production/the market). results in practice in an exercise in futility . with "traditional" DVD and pendrive, is BTW one of the best pieces of (involuntarily) humour I have seen lately. right now you are simply comparing apples with oranges , which though established as being possible and scientifically valid : http://www.improbabl...1-3-apples.html results in practice in an exercise in futility . Wonko, no offense at all, but I have to disagree with your apple and oranges comparison, at least in this case. Look at the things this way and by using a similarity/parallelism. I need to feed-on and I have the choice for apples or oranges; then, I'll going to choose the inexpensive one between the two. At the end, I have reached my main scope, at the end : to sate my hunger. Now, going to the necessity to boot an ISO (or whatever image) with a dedicated hardware in the most simple way, I have 2 possibilities : Zalman and isostick, which cost a lot more than Zalman. By using the same behaviour as before, I'll go with the Zalman, because not only it costs less, but it has a better performance/robusteness (this last with a general meaning), compared to isostick. Besides, even if we consider that the 2 things (Zalman & isostick) are really different (even if having the same usage), I'd have no doubts that, actually, Zalman stays on another planet, just only for the basic idea to have a HD as mass storage (larger capacity, better reliability and higher MTBFs). Nevertheless, I'd be available and ready to support the isostick development and make it to become more than an artisan thingy; unfortunately its price is not encouraging me. Please, take this statement in the positive sense, as I am convinced to give an advice more than criticize the isostick per se. Sure, no offense taken, we are just talking . Still, they are different means to reach a same goal and cannot really be compared - besides the actual "technical" differences - because you cannot (for serious) compare a "mature" product (as said at least in it's third incarnation) with a "new kid on the block". unless you use a SSD in it. I will actually go further and state how the Isostick has the advantage of being immune from strong magnetic fields (and again you can have the same using a SSD in the Zalman case). since electronics reliability & robustness (and assembly procees reliability, as well) is something to sink my teeth into, I accept the challenge for the game. Do you have any life-time data about microSDs to compare with HDs (real-life data, not coming from the endurance tests, such as MTBF) ? Do you have an idea of what is the meaning for the "robustness" (not only from the mechanical viewpoint) of a hardware-based technology ? So as I understand it, you'd never pay the current price for any ISOSTICK, no matter its features/abilities, as the Zalman unit (and some 2.5" sata hdd/ssd) already brings the features/abilities (ISO-booting) that you need/want (in a sense of "good enough") at a cheaper price. You're booting from an ISO at about 100MB/s (harddisk) in perfect circumstances. Just for theoretical case: if the price of Isostick would be equal to the Zalman unit, would you get it then? Or still one or more of the below? * no, already got "Zalman + HDD"
What would you do if the price of Isostick would be lower than Zalman unit? Wonko already mentions a few benefits of isostick that a Zalman unit, if combined with an SSD, could match. Dedicating an SSD to an external storage unit (just for silence and/or robustness) seems a bit like burning money though. Maybe that's where isostick comes in after all (then again, lots of decent SSDs with at least 32GB or at least 64GB, are also cheaper than isostick). If the cost (or value-for-money ratio) stops you, and lowering price isn't an option yet, then waiting or giving up are the only options left. 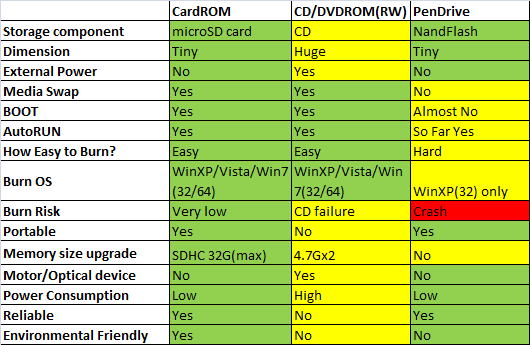 With nothing special happening, both hdd and flash/ssd can fail for several number of reasons. I'd hope to say a good SSD nowadays (so nothing Sandforce and/or OCZ, nor some ancient stuff) functions longer than a harddisk. Flash cards you're quite right that they can fail quite soon if writing to them too excessively (don't use them like how you would use an SSD, for example as Windows main disk). If you'd like to test flash versus harddisk whenever they fall to the floor, you step on them or you shake them like crazy, be my guest. http://www.xtremesys...ce-25nm-Vs-34nm tests how long you can write to a storage device 24/7 (they keep running the benchmark over and over until the device no longer functions). OT, but not much, to me a 1 Tb 2.5" hard disk is a lot like "asking for trouble". you can challenge those two statements if you like. NO, no ideas whatever, only I would call it "durability". ....and now some comments for Wonko (I wouldn't like to make a unique post which should have been too long and annoying. Sorry for that). In order to be clear, the basic concept beyond microSDs or pen-flashes is their characteristic for a strictly temporary data storage; never they have to be used for a long storage. The veracity of this statement is just based on thier expevted (and measured) low reliability. Flash is reliable for pure data storage for about 6 years or so, which people might consider short-term. Backups (to harddisks, optical discs, or tape) are intended for long term data storage/preservation. That enabled restoring isostick files if something should ever happen. I don't know how long harddisks are intended to live. All I know is those rescue-firms can retrieve data from harddisk platters (for a not so pleasant price) while retrieving data from flash cells without a working controller and proper/correct/intact flash/data mapping tables is impossible. The other thing I know is I can't read my old WD Raptor 15K RPM harddisks anymore, nor whichever SCSI drives I still have. I'd mainly be worried about data integrity, and only to a limited extent storage device integrity (durability/robustness). again, in principle flash cards have to be used only for a temporary storage, limited only to transport data. If you do not believe me, ask to whatever IT administrator, then. And In conclusion, if you do not have a storage device integrity, how can you hope to report a data integrity ? That's because you emphasize how 'proven technology' inherently flawed devices like harddisks are (due to moving parts, which can fail. Same as fans in computer). The 'in-principle flash only used for temporary storage' is based on the rubbish lifetime of such a device once you use it as an operating system disk due to the many many reads and writes happening every second. As flash has a limited amount of refresh cycles for each cell, you'll burn through them in no time. However, simply storing some ISO files, refreshed once a week or so, is no big deal whatsoever. It should stay reliable for years when used this way. IT admins wouldn't even touch removable media. Network distribution all the way. Your backup remark is correct. I'm still not convinced my input should be considered noise. You made your point already by stating 'too expensive and/or not enough value for money for me at the current price'. There's simply nothing to discuss about this statement, in a thread handling the subject of item availability (in sufficient quantity, at a fixed price). All we could do is try to ask what you'd consider a fair price, or fair value for (current amount of) money with regards to isostick. Goodluck trying to get it to $30 or so. Finally, we are pointing to the good point of a "correct cost". I could "shot" a rough price of 20 $, just extimated in 10 seconds, even I'd like to have a better extimation, based on the real bare cost of isostick. The kickstarter project mentions $75 as lowest amount to get a beta-isostick ( including some flash card). No idea if that's "at-cost" for a prototype, doesn't matter much either. Development of firmware and software are big costs usually. A profit also kinda helps to make a living out of selling stuff. Once all software development is done, it could be time to send isostick to Foxconn for mass production and you'd get a way cheaper unit (in the range of $40 to $60 would be my guess). All in due time. And then the cycle repeats with improved versions. I don't think you'll get a detailed overview of costs, kinda trade secrets. Development of firmware and software are big costs usually. A profit also kinda helps to make a living out of selling stuff. Indeed, this is my full-time job and I am the only one working on it (with the occasional exception of a good friend who wrote the current version of isosel in x86 asm, as he is far more proficient with it than I!). Once all software development is done, it could be time to send isostick to Foxconn for mass production and you'd get a way cheaper unit (in the range of $40 to $60 would be my guess). I don't think you'll get a detailed overview of costs, kinda trade secrets. Have to agree however, I will say the isostick hardware is trivial, and there are photos of bare boards on my flickr account. It wouldn't take much googling to figure out the BOM cost. I will say the BOM cost of isostick is far higher than for example an 8GB USB Flash Drive, due to the more general-purpose processor on isostick. Normal USB flash drives use high volume mass produced single-purpose chips, optimized to very small silicon area. Incidentally the Zalman uses a relatively low cost processor, but last I checked the datasheets are hidden behind NDA. While NDAs are sometimes a fact of life, I try to avoid them where possible -- especially since I like the idea of open-sourcing the product before/when I finally put it out to pasture. Of course the data in the second series is fake, the good thing is that also data in the 1st and 3rd series are made up. If you prefer ALL data on that spreadsheet has the SAME level of accuracy , which automatically makes the series comparable . You're right, but the smaller and portable is the device and the greather are the opportunities to mishandle it - this is the practical and real-life !!!!! or had it fall and go through a grate . It happened once to me (actually with a voice recorder attached in a belt holster) but I happened to meet quite a few people that have dropped their handy in a basin, bathtub (or worse ) or out of a boat, the Isostick being so small and possibly attached to a keyring has obviously much greater possibilities to fall and be immersed in water or other liquid than the Zalman thingy, but the first is recoverable for sure, the second is very, very likely not. I know very well about development costs (and its distribution among the hardware, firmware & software branches) as my main work is to support R&D (at work, in my organization) but, without any offense at all for elegantinvention, from the pictures on flickr I could see that several hardware versions have been developed over the time, not only for the pcb layout but also for the mechanics solutions. It is clear that with so many hardware versions, the development costs will go up and up and will bear upon the final costs. Now I'm more and more convinced that isostick belongs more to artisan work. elegantinvention, just a curiosity : Have you already thought about the possibility for a patent related to the firmware ? I appreciated your irony, but it is clear you are playing with numbers and with logic. you surely already know how inaccurate are your conclusions and, more importantly, the "automatic" conclusion is groundless and it would need some deeper analysis. As per the digital archiving, I have to say that You're inviting me to eat pasta and meat !! !, as it is said in my birthplace (sorry for the italian translation : Mi stai invitando a pasta e carne !!! ). In fact, while I agree with your remark on the maybe for the M-Disc solution, I think that its final usage, if any, is (will be) only limited to large organizations and istitutions. For a simple end-user, I think there are other, more friendly solutions, such as DVD-RAMs, even if they have been surprisingly abandoned in these last years (I have to admit I'm continuing to use them for archiving, until I'm able to find them on the market). It should be clear that for making this solution to work in a safe way, it need to be complemented with other (more simple) ones. Anyway, this topic is OT, but if Wonko agrees, we could open another specific thread and discuss about it. Beyond that, however, the cost of a patent is very high, and defending it is far beyond my means even if I were to get one. I know about the high costs related to patents, especially if the patent's validity is extended worldwide (and not only locally). Anyway, and just to be more precise, my question was relevant to the firmware not to software. Should the basic idea covered by isostick firmware really "smart", then you could just sell its intellectual property rights. But you're right. This forum is not the most indicated place to discuss about patents.